Heel pain is a very common foot problem that can interfere with your normal activities. Pain may be felt on the bottom of the heel, just behind the heel or in the arch of the foot. Often, this type of pain comes on gradually and is usually worse in the morning upon arising. Wearing flat shoes also have been found to trigger the pain. Injuries, sprains, fractures, pinched nerves, and wear and tear on the heel pad are common causes of heel pain. Accidently pounding the foot on a hard surface, being overweight or wearing poorly fitting shoes can also cause it. It may also be due to several medical conditions, including Achilles tendinitis, bursitis, fibromyalgia, gout, heel spurs, plantar fasciitis, arthritis, tarsal tunnel syndrome, and tendinitis. Those suffering from heel pain are aware of the intensity of pain and discomfort that can come with it. However, it is rarely a health threat. You can use some home remedies and incorporate certain lifestyle changes to ease your symptoms. If your heel pain becomes severe and you have difficulty even taking a step, consult your doctor or a podiatrist. Here are the top 10 ways to get relief from heel pain naturally. Applying ice to the heel in a cold compress is one the best ways to relieve heel pain naturally. The cold temperature has a numbing effect that controls pain and inflammation. Furthermore, ice is effective in reducing pain associated with foot tendonitis, plantar fasciitis and a bone spur. Make a cold compress by putting some crushed ice in a plastic bag, then wrapping it in a thin cotton towel. Apply this pack on the painful area for about 15 minutes. Repeat a few times a day or as needed. Another option is to freeze a bottle of water and roll it over the painful area for 10 to 15 minutes. Repeat as needed. Note: Never apply ice directly on the skin, as it can cause frostbite. Massage is another simple, natural treatment for heel pain. While it is not a long-term treatment option, it provides quick relief from pain. Massage also will relax the muscles, release the pressure, reduce the stiffness and improve blood circulation. You can massage your painful heel any time of the day, and it is recommended particularly before going for a run, after exercising and before going to bed. For massaging, you can use any kind of oil, such as olive, coconut, sesame or mustard oil. Apply some warm oil of your choice on the affected area. Using both of your thumbs, gently apply pressure on the painful area for a few minutes. Massage sole of your foot for 10 minutes. Repeat a few times daily until the pain subsides. You can do the massage yourself or get help from an expert. In many cases, stretching exercises can help reduce the pain and promote quick recovery. It even strengthens the muscles and tendons in your foot to prevent further pain. One of the best stretching exercises for heel pain is the “standing wall stretch”. Stand barefoot several feet away from and facing a wall. Using both your hands, press into the wall. Placing one foot forward, slowly lean and feel the stretch along the back of your leg and heel. Do it 10 times on each side to get relief from heel pain. An Epsom salt soak can bring instant relief from heel pain. The magnesium sulfate crystals help reduce pain, swelling and inflammation. Furthermore, the heat of the warm water promotes relaxation. Mix 3 tablespoons of Epsom salt in a tub of warm water. Soak your foot in it for 15 to 20 minutes. Pat dry your foot and apply some moisturizer. Gently massage your heel for 5 minutes. Repeat 2 or 3 times a week until the pain is gone completely. When it comes to natural treatment for pain, turmeric is an excellent remedy. Curcumin, a component in turmeric, works as a potent painkiller and anti-inflammatory agent. Put 1 cup of milk and 1 teaspoon of turmeric powder in a pot. Simmer it on low heat for 5 minutes. Add a little raw honey. Drink it 2 or 3 times daily to ease pain. You can opt to take a turmeric supplement of 400 to 600 mg, 3 times a day. However, consult your doctor before beginning any supplement regimen. If you have heel pain due to arthritis or a bone spur, fish oil is a good treatment option. Being rich in eicosapentaenoic acid (EPA) and omega-3 polyunsaturated fatty acids, fish oil helps reduce pain. It even helps reduce muscle stiffness. A 2006 study published in Surgical Neurology concluded that omega-3 essential fatty acid appears to be a safer alternative to nonsteroidal anti-inflammatory drugs (NSAIDs) for treating arthritis pain. Take up to 3 grams of fish oil containing at least 30 percent EPA/DHA twice daily. However, it is recommended to consult your doctor first. Note: People taking blood-thinning or diabetes medication should not take fish oil supplements. If your heel pain is caused by some kind of muscle strain, try ginger as a natural treatment. A 2010 study published in the Journal of Pain found that ginger reduces muscle pain caused by eccentric exercise. Ginger contains anti-inflammatory and pain-relieving properties that can help combat pain and inflammation. Its potent compounds called gingerols prevent the production of pain-triggering hormones. Plus, it improves blood circulation throughout the body. Drink ginger tea up to 3 times a day or include raw ginger in your cooking. To make the tea, boil 1 or 1½ cup of water, add 5 or 6 ginger slices in it and simmer for 5 to 10 minutes. 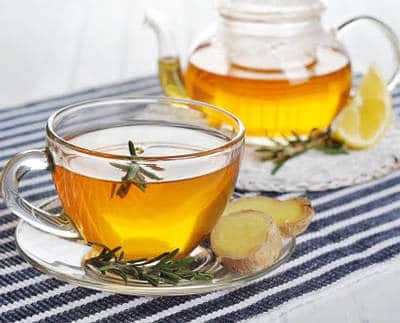 To improve its taste as well as health benefits, you can add a little lemon juice and raw honey in your ginger tea. Take 1 or 2, 500-mg ginger supplements 3 or 4 times daily, but only after consulting your doctor. Massage the painful area with ginger oil a few times daily. Another effective treatment is an apple cider vinegar wrap. It has antioxidant and anti-inflammatory properties that work as an effective pain management regimen. 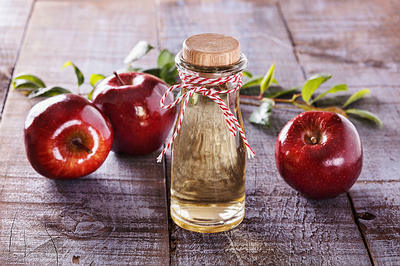 Pour 1½ cups of water and ¼ cup of apple cider vinegar into a pan. Heat the mixture until it is warm. Soak a clean washcloth in it and wring out the excess liquid. Place the washcloth on the painful area and cover it with a dry towel to retain the heat. Reapply 2 or 3 times. 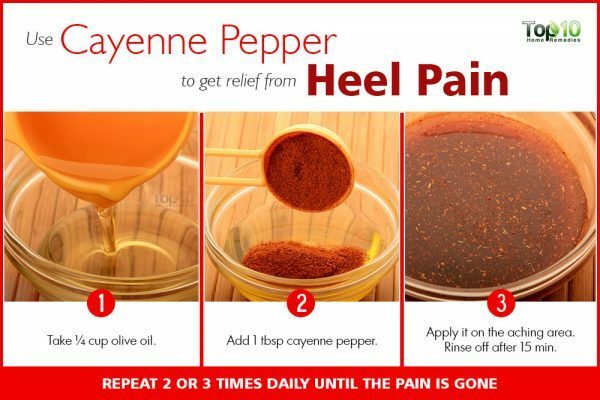 Cayenne pepper is rich in capsaicin, a compound that has natural pain-relieving properties. It can ease heel pain as well as muscle strain, joint pain and lumbar pain. Mix 1 tablespoon of cayenne pepper in ¼ cup of warm olive oil. Apply it on the painful area and allow it to sit for 15 minutes. Rinse it off with warm water. Repeat 2 or 3 times daily until the pain is gone. Alternatively, you can use an over-the-counter pain-relieving cream containing capsaicin. Use the cream as directed. 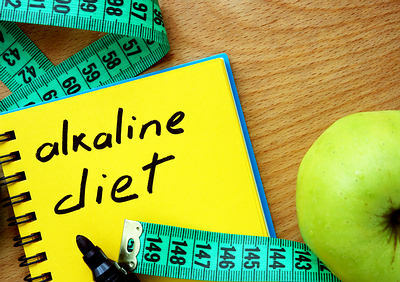 Another good way to reduce pain and improve your overall health is to eat a well-balanced alkaline diet. Alkaline foods help maintain a proper pH level in the body, which in turn reduces inflammation. It even reduces calcium buildup, one of the main causes of heel spurs. Include more fresh fruits and vegetables in your diet. Mix the juice of ½ lemon in a cup of water and drink it daily to boost alkalinity. Instead of regular table salt, use pink sea salt, also called pink Himalayan sea salt. Avoid excess intake of calcium-rich foods, especially dairy products. Limit intake of animal-based foods, sugar, processed foods, caffeinated drinks, alcohol and refined grains. When experiencing pain, rest your heels as much as possible. Cut down on extended physical activities for a while to give your heel a rest. Avoid going barefoot, as it will put undue strain and stress on your heels. Always wear shoes that fit properly. If needed, use heel lifts and shoe inserts. If needed, wear a night splint, a special device that stretches the foot while you sleep. If you are overweight, try to lose weight gradually. Always stretch your muscles before exercising. Rest when you feel tired or if your muscles ache while exercising. I have pain in my both feet.Possibly due to Neuropathy. Any natural remedy will be appreciated. I like your suggestions and helpful to follow. Thanks a lot, it really helps! I have heel pain and am not sure if it is planter fascitis. I do work as a cashier about 8 hours a day. Sometimes less. 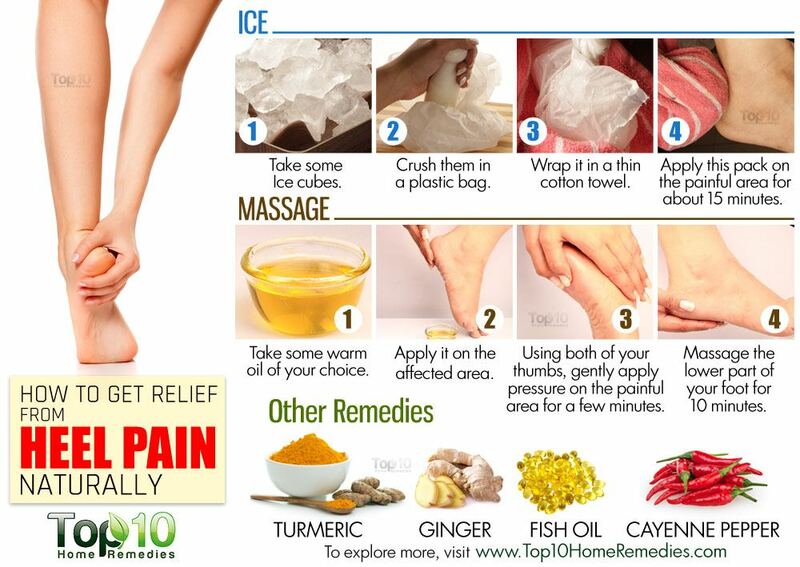 I can try these remedies and see if this helps to relieve pain. thanks for valuable tips for heel pain. as i am a patient having bone spur & high level of uric acid, i will follow all tips. oh! very useful tips. sincere thanks. expecting more.